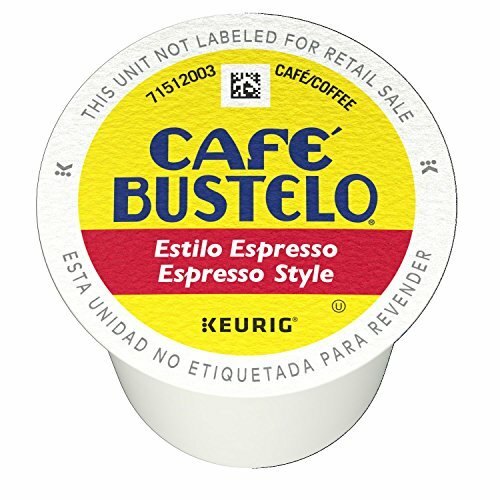 Featuring a full-bodied, bold flavor, Cafe Bustelo Espresso Style K-Cup Pods offer an invigorating start to your morning. This dark roast is made from 100 percent pure coffee beans and perfectly roasted to deliver a rich, intense flavor sip after sip. Ideal for creating mixed coffee beverages such as cortaditos or café con leche, the coffee stands up to milk and sugar exceptionally well and retains its rich flavor even after mixing. It comes packaged in convenient K-Cup pods that make brewing fast and effortless.